2 Liters of Sintratec Powder come included with your S1. This will get you started but to make sure you don’t run out of powder, you may buy more in our Shop. The white lamp indicates if the laser is running. Used to enable the laser. The key can be removed only in the OFF position. Move the key to the ON position prior to starting the printing process, and return it to the OFF position after the printing process has finished. The white lamp glows when the Sintratec S1 is switched on. Used to switch the device ON (operational state) and OFF (standby mode). Used to switch the power supply on and off. Also serves as EMERGENCY STOP switch. Detach the tightening straps (1) at the half-pallet. Lift off the covering (2) and the lid (3). The device can now be lifted off the pallet. Store packaging material and use it in case the device has to be returned to the manufacturer. The place of installation must be stable, flat and have a sufficient load-bearing capacity. Vibrations during operation could have an adverse effect of the quality of printing. Select a suitable place of installation accordingly. 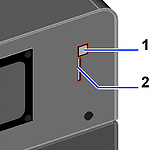 Comply with the minimum edge distance requirements at the rear and sides, as indicated in the diagram. Ensure that the door can be opened as much as possible. It is essential that the main switch at the rear can be operated. 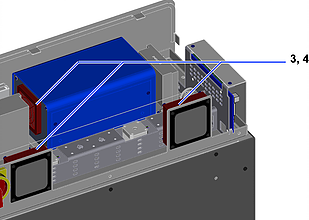 The fan intake openings at the rear must not be covered. Ideally, for maintenance reasons, the device should be accessible from all sides. 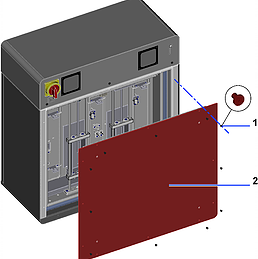 Set down the device at the prepared place of installation, with the above requirements taken into account. Align the device using the 4 adjustable feet (1) so that it is horizontal and stable. Remove the securing elements for transportation and keep these handy in case they are needed later for relocation purposes. 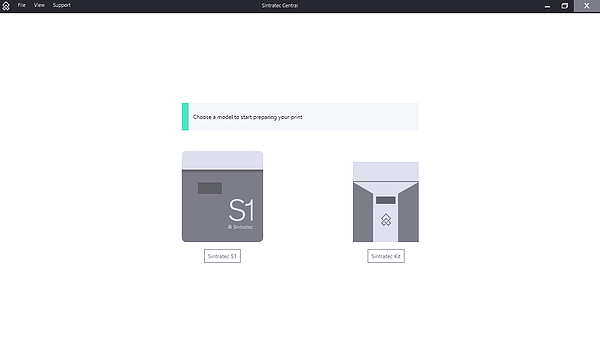 Please follow the steps in the Software section of the Sintratec Academy to install the Sintratec Central. There you also find all about how to use the software. Connect the mains cable with the C13 coupling (for non-heating appliances) to the C 14 mains plug and the mains socket. Connect the USB cable to the device (1) and to the computer where “Sintratec Central” is installed. Insert the SD card (2). Configuration and production data are stored on the SD card. The supplied SD card is blank prior to use. Following the installation procedure, the device can be put into operation. Move the main switch to the ON position. Use the ON/OFF button to switch on the device (white lamp lights up). Start “Sintratec Central” at the computer connected to the device. ​At the computer, the connected device is automatically detected and is ready for operation. 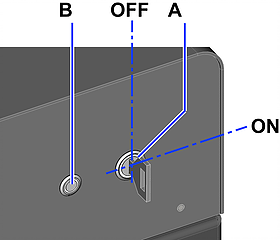 Ensure that the USB cable is connected to both the computer and the device. Ensure that the device is on. Ensure that the latest USB driver available from the Sintratec Academy has been installed. The Windows Device Manager can be used to check whether the device has been correctly identified. It must be listed as “Sintratec Kit/S1” under “Universal Serial Bus Devices”. 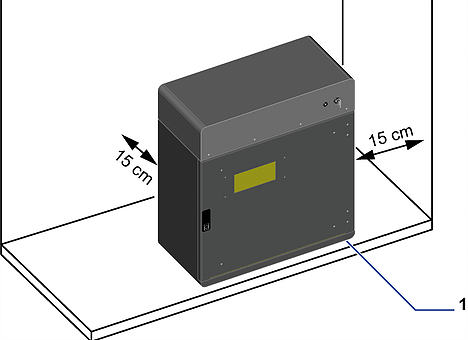 We recommend that, directly after putting the device into operation, you produce the sample print object as the first print object. Then any calibration that is required can be carried out. 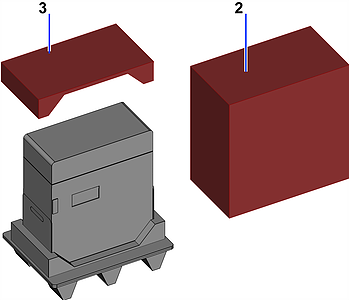 The printing process is described in the “Operation” chapter below, with the sample print object being used as an example for this purpose. You should maintain your printer to keep the printing quality high and expand the life span of your printer. After every print you have to clean the printer. Every now and then you should service your printer. We recommend to use the Sintratec Cleaning Kit which includes all the items above and some more. Please contact us to learn more about the Cleaning Kit. Lift out the excess powder container (1) and empty it into a clean container. Place the excess powder container back in the device. ​Residual powder can be re-used after treatment. Pull out the collecting tray (1) and empty it into a clean container. Place the collecting tray back in the device. 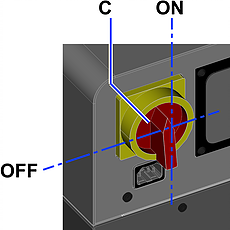 Turn away the holder (1) and remove the glass cover of the laser (2). Clean the glass on both sides using a soft cloth and a glass cleaner. Avoid touching the glass with a bare hand and thereby soiling it. Wear gloves. Refit the cover glass of the laser by applying the same procedure but in reverse. ​During the printing process, residue can settle on the glass cover of the laser and thus cloud the glass. The performance of the laser can be impaired if the glass is not cleaned regularly. Remove and clean the excess powder container and the collecting tray. 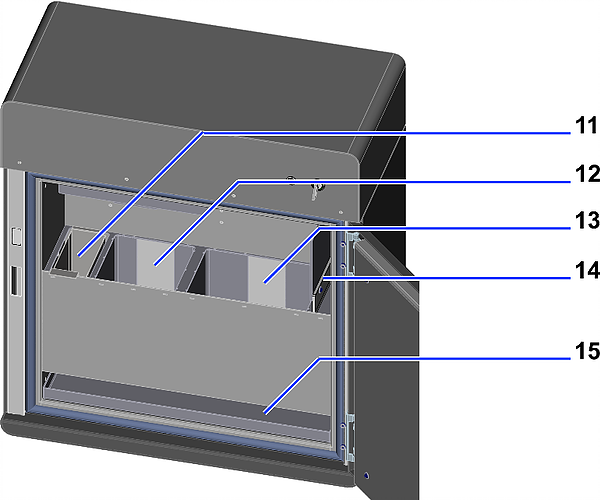 Place the excess powder container and the collecting tray back in the device. Do not use compressed air to clean the device. 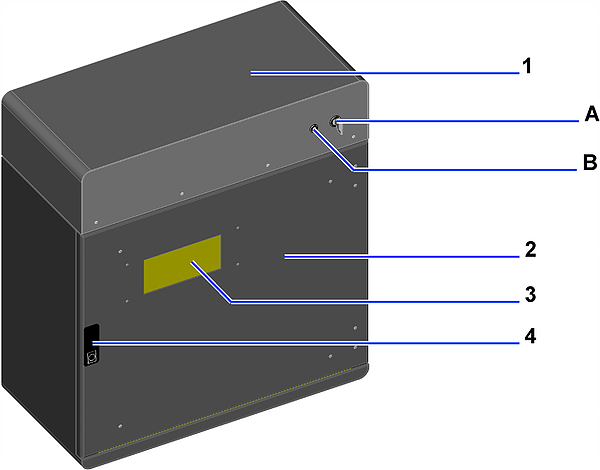 If the device is cleaned with compressed air, powder can enter the electronics section or the drive units, which can lead to malfunctions. During the printing process, residue can settle on the inspection glass and thus cloud the glass. Regarding the view of the working section, visibility can be impaired if the glass is not cleaned from time to time. Switch off the device and disconnect it from the mains. Carefully clean the rear section. Remove any dirt at the drive units and heating elements using small brushes/cloths. Refit the cover by applying the same procedure but in reverse. If powder falls into the collecting tray from the powder container or the print container, the seal of the respective platform may be worn. 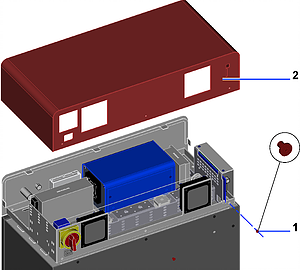 The platform and the seal can be replaced as a single unit. 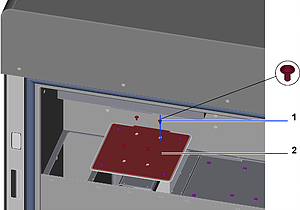 Move the platform to the top end position (using the “Sintratec Central” print software). Loosen 4 screws (1) and lift the platform (2) off the support. 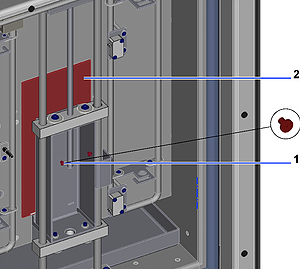 If powder falls into the rear section from the powder container or the print container, the seal of the respective rear container wall may be worn. 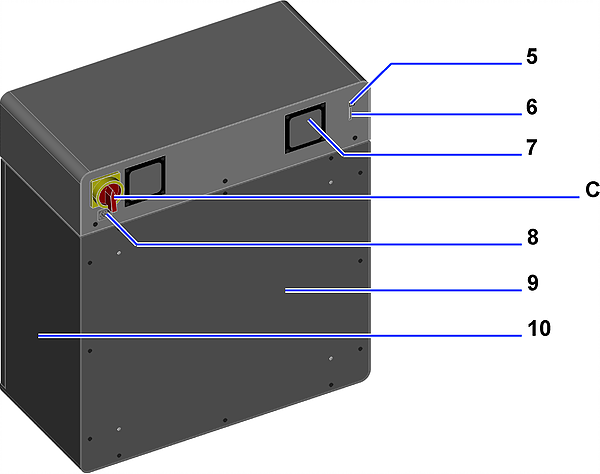 The rear container wall and the seal can be replaced as a single unit. 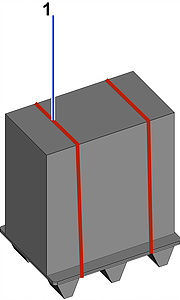 Move the platform to the bottom end position (using the “Sintratec Central” print software). Loosen 2 screws (1) inside carriage. Carefully move the rear container wall (2) laterally and upwards and then remove it. Fit the new rear container wall by applying the preceding two steps but in reverse. Refit the rear cover by applying the first four steps but in reverse. Replace every 150 operating hours or every 6 months. Lift off the cover (2). Remove the outlet grid (3) at the 3 fans (insert screwdriver behind each grid and lever off). Remove the filter mats (4) behind the outlet grids. Insert new filter mats and then snap the outlet grids back onto the respective housings.